When it comes to disaster recovery, rapidly growing data volumes, distributed computing models, and new technologies all combine to present an ever-changing playing field. Safe recovery distances can also mean painfully slow replication and backup across the WAN in addition to the costs to accomplish this. 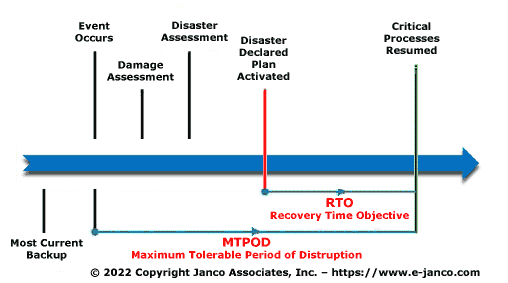 Janco's "Disaster Recovery and Business Continuity Template" leads the way to implementation of the latest disaster recovery technologies and cost savings strategies. Enterprise of all sizes can build a functional disaster recovery plan with this tool and make your own disaster recovery efforts more efficient. Disaster Recovery is the process an organization uses to recover access to their software, data, and/or hardware that are needed to resume the performance of normal, critical business functions after the event of either a natural disaster or a disaster caused by humans. While Disaster Recovery plans, or DRPs, often focus on bridging the gap where data, software, or hardware have been damaged or lost, one cannot forget the vital element of manpower that composes much of any organization. A building fire might predominantly affect vital data storage; whereas an epidemic illness is more likely to have an affect on staffing. 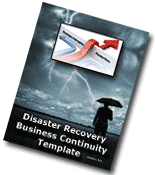 Both types of disaster need to be considered when creating a DR Plan. Thus, organizations should include in their DRPs contingencies for how they will cope with the sudden and/or unexpected loss of key personnel as well as how to recover their data. All plans need to encompass how employees will communicate, where they will go and how they will keep doing their jobs. The details can vary greatly, depending on the size and scope of a company and the way it does business. For some businesses, issues such as supply chain logistics are most crucial and are the focus on the plan. For others, information technology may play a more pivotal role, and the plan may have more of a focus on systems recovery. But the critical point is that neither element can be ignored, and physical, IT and human resources plans cannot be developed in isolation from each other. At its heart, BC / DR is about constant communication. Preparation has two primary parts. The first is putting systems in place to completely protect all financial and other data required to meet the reporting regulations and to archive the data to meet future requests for clarification of those reports. The second is to clearly and expressly document all these procedures so that in the event of a SOX audit, the auditors clearly see that the DRP exists and will appropriately protect the data.